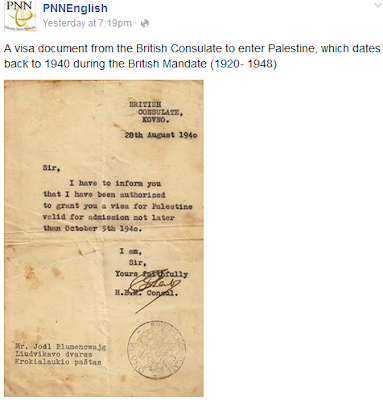 An average person, looking at this image posted on Facebook by Palestine News Network, would surely express sympathy for the poor desperate soul in Kovno granted the visa and hope he managed to avail himself of it and escape death in the Shoah. Not so the anti-Israel activists, composed of the usual array of suspects, who have rushed to embrace it for their own malodorous ends. No curiosity about the person granted it or his fate. Only the usual demonisation of Zionism and Israel, only the usual distortions. of the Mandatory period. I suppose the only surprising thing is that any of us continue to be surprised. As a click here shows, Joel Blumencwajg was born in a shtetl in Volhynia in November 1924. He reached Palestine in 1941.